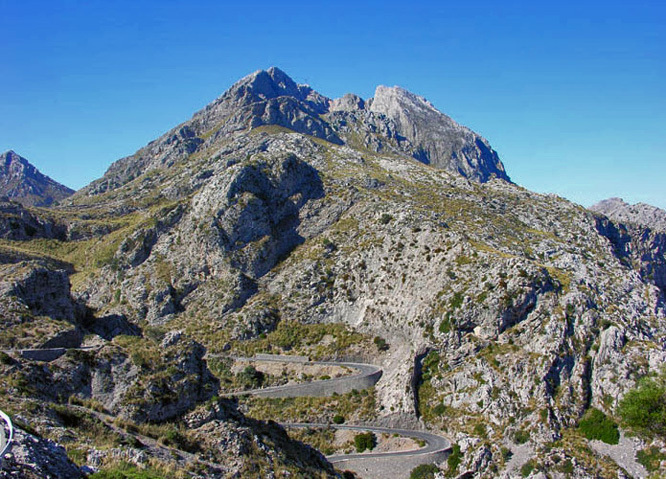 In 1953, Spain’s dictatorial leader, Francisco Franco, signed a deal with the US American government, signing over occupancy and rule of Mallorca’s highest mountain peak, Puig Major, together with 11 other areas of land on Spanish national territory, in order to allow the installation of military equipment such as radar, surveillance, espionage and so forth. In 1955, US military personnel started constructing a road with a length of 8 km to span the 850 m of difference in altitude between the military base camp and the peak of the mountain (see photo bottom). In 1959, the radar installations were built and erected. To construct these installations, a level platform was needed and it was decided to lower the peak of Puig Major by 9 m in order to have a sufficiently plain base for the design of the construction. 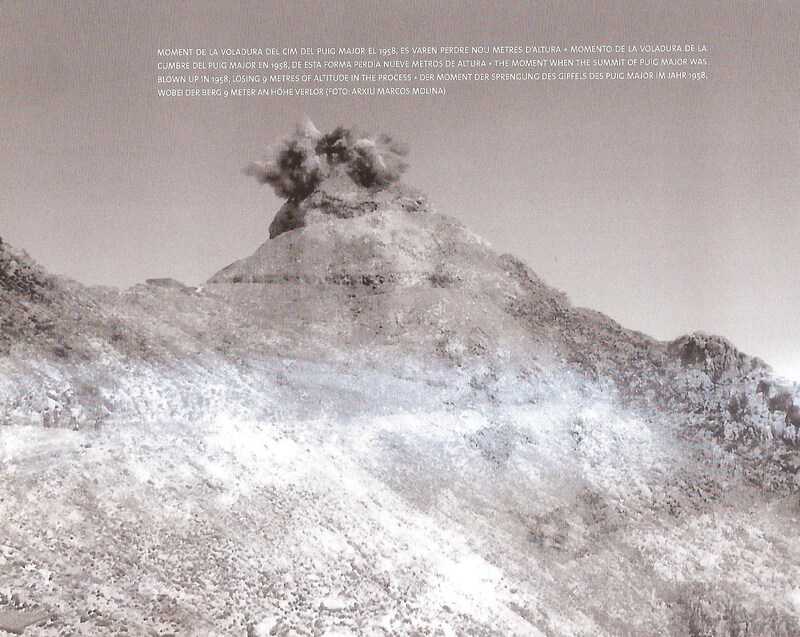 Massive explosions were carried out to get rid of the mountain peak rock. Supposedly, a photo exists somewhere on the Internet taken at the precise moment of the mighty dynamite explosions but, for now I could not find it anywhere. If I should ever find it, it will be added later on. Once the radar installations were completed they were inaugurated in 1960 in the presence of General Franco. 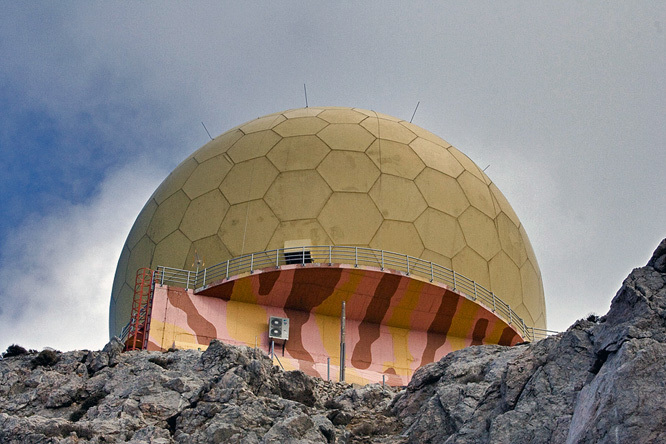 The radar installations consisted initially of two smaller ball-shaped structures. In 1965, command of the military installation was handed back from USA military jurisdiction to the Spanish authorities with only a small number of US personnel remaining until 1993. In 2003, the old installations were switched off to be replaced with new and more sophisticated equipment for which new installations had to be constructed, this time allowing it all to be housed inside one gigantic ball-shaped structure (photo centre). 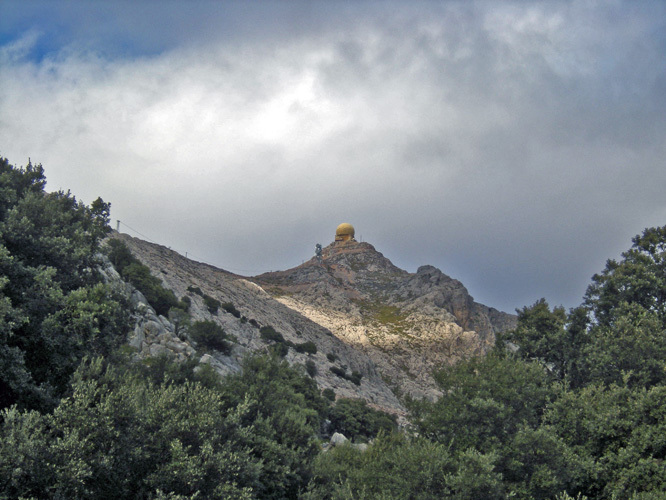 The peak of Puig Major remains designated military zone and is off-limits to us mere mortals. Exceptional visits and hikes are allowed subject to prior application with the Spanish military forces and their subsequent approval. The photo (top) was taken near Fornalutx, Mallorca, Baleares, Spain. The date: December 15th, 2011. The time was 15:31:05. The photos (centre and bottom) were borrowed from the Internet, courtesy of ojodigital.com and ritmocars.com, respectively. I always wand to know the reason of those white balls en el Puig Major , Thank you very much for the information and every day info from Majorca.. I’m from Lluchmayor resident in Spokane WA and now in New Orleans, La. Thank you so much for every day information !!!! Continually amazed at how you manage to come up with all these amazing anecdotes about our island! My father was stationed at the radar base 1959-1962 and we lived in Palma. The USAF built an American school which opened the year we moved back to the States. We went to a 3-room farmhouse school with American teachers and I was old enough to know my parents had quite the life there! My brother and I (we are early 60’s) dream of someday going back to try to find where we lived, school etc. Dear Cathy, I and my younger brother were among your classmates at the “little red schoolhouse” in Mallorca. I still have the school book with pictures of the students and teachers. I will try to find the book. Still have good memories of our three years there. 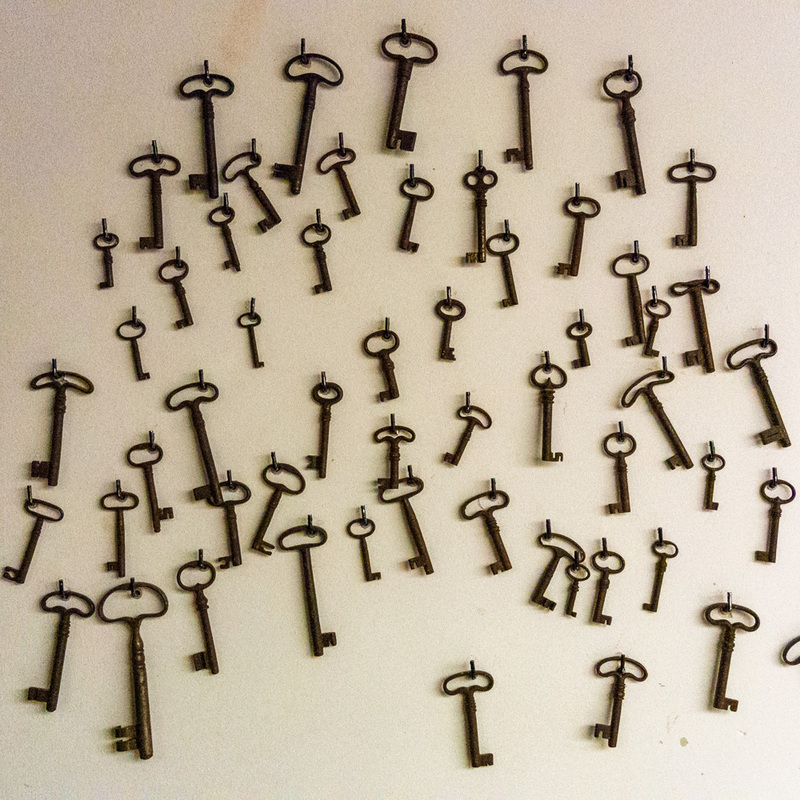 Congratulations on your fascinating blog. thank you, Jaume, well spotted. that’s the one.